This year, with inflation in Egypt hitting record highs, customers seemed more interested in gawking at the cattle than buying any ahead of last Friday, the first day of Eid al-Adha. 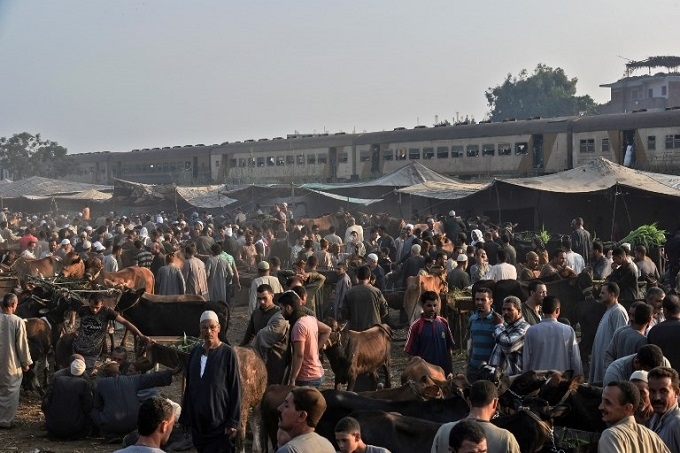 The cattle traders in the Ashmun market, north of the capital Cairo, jostled to lure customers into buying a buffalo or a sheep for Eid al-Adha, the annual Muslim holiday when custom requires a sacrifice. 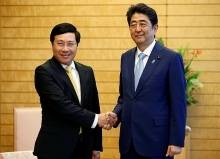 "Last year there was more business. This year, no one wants to buy cattle because of the increased prices," said one trader, Mohammed Masoud. The cost of everything has gone up in Egypt since the country floated the pound late last year -- decreasing its value to the dollar by half -- and raised fuel prices. Masoud fed his livestock fodder that cost 2.5 pounds ($0.14) a kilogram before the currency was floated. It now costs him seven pounds. "A calf that cost 15,000 pounds last year now costs 30,000," he said. Eid al-Adha is one of the holiest days in the Islamic calendar when the major pilgrimage takes place in Mecca, Saudi Arabia. To commemorate Abraham accepting to sacrifice his son to God only for him to be provided with a ram instead, many Muslims sacrifice a sheep or a cow. Meat has always been a luxury to many in a country where poverty is rampant, but the new prices are putting off even those who had purchased cattle in previous years to sacrifice on the first day of Eid and distribute the meat among family and the needy. In July, annual inflation hit 34.2 percent according to official figures. That follows a series of austerity reforms linked to a $12 billion International Monetary Fund loan that Egypt, hit by years of tumult, desperately needs. "Even if people want to buy meat, a kilogram costs 130 pounds," said Nasser Abou Kila, who had come to the market in the province of Menufia after spending two weeks trying to find a better deal elsewhere. Cattle traders say they were especially unlucky this year with the inflation compounded by an outbreak of foot-and-mouth disease, which killed off cattle and raised the prices of the ones that survived. Butchers who buy from large markets, such as the one in Ashmun, also have to factor in increased transport prices. 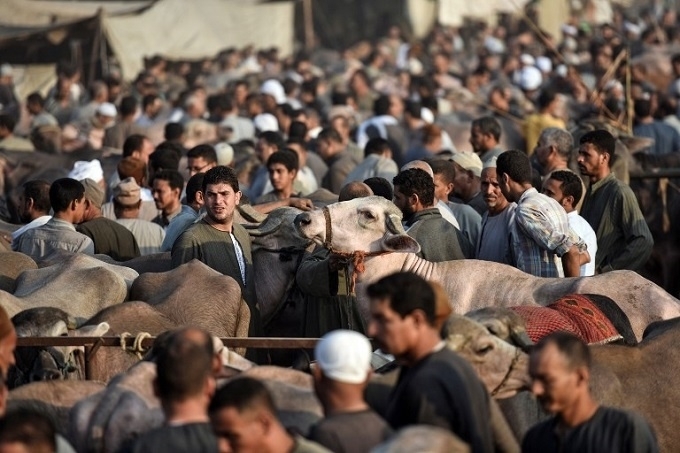 "Last year it cost 100 to 150 pounds to transport a head of livestock to Cairo. This year it costs 400," said one butcher, Said Masoud. Another said "It was 85 pounds for a kilogram then and now it's 150 to 160." Customers say they are feeling the impact. "To buy two kilograms for two days, you have to pay 300 pounds, and that's just for meat," said Naglaa Rajab, a housewife in her 30s. The government of President Abdel Fattah al-Sisi, a former army chief elected after he overthrew his Islamist predecessor in 2013, says it has no choice but to undertake the tough economic measures. But it is mindful of the strain the reforms are putting on Egyptians, many of whom can barely scrape by every month. Ahead of Eid al-Adha, the agriculture ministry said it would offer about 50,000 heads of cattle at cheaper than market price, at a discount of between five and 10 pounds per kilogram. "We're keen that every citizen should have the right to reserve a head of cattle for sacrifice," said ministry spokesman Hamed Abdel Dayem. But in a country where 28 percent of the 93 million population live under the poverty line and with inflation squeezing the middle class, less Egyptians will be buying livestock. "Whoever sacrificed a cow last year will sacrifice a sheep this year," said Rajab. "And whoever sacrificed a sheep last year won't be able to afford anything this year."